LavNav Lights Up Your Toilet For Those Late Night Bathroom Trips | OhGizmo! If you have to get up in the middle of the night to use the bathroom, the last thing you wan to do is turn on a bright light. Night lights are great, but there’s one place that really needs to be decently-lit, and there isn’t always an outlet right next to it. That’s right, the toilet. 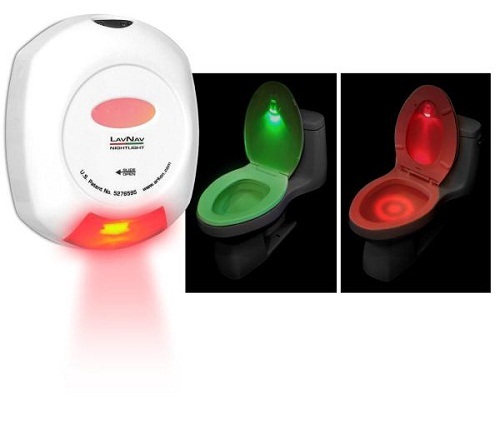 The LavNav solves that problem by illuminating just the toilet with a soft green or red light. The light has a motion sensor that makes sure it is only on when someone walks close to it. It will stay on long enough for you to do your business, then automatically shut back off. The light will turn from green to red to let guys know to put the lid back down. It might not be the classiest of devices, but this $32 purchase is better than flipping on that bright light at 3 in the morning. I used to have these lights. Only during the day, you expect it to be lighter, but they seem too dark because you enter the toilet from a lighter environment. Your eyes need some time to adjust to the light level. But during the night – it's just perfect!